The Crisis in Venezuela Deepens; US and UN Threaten to Intervene, Is a Similar Crisis Coming to America? 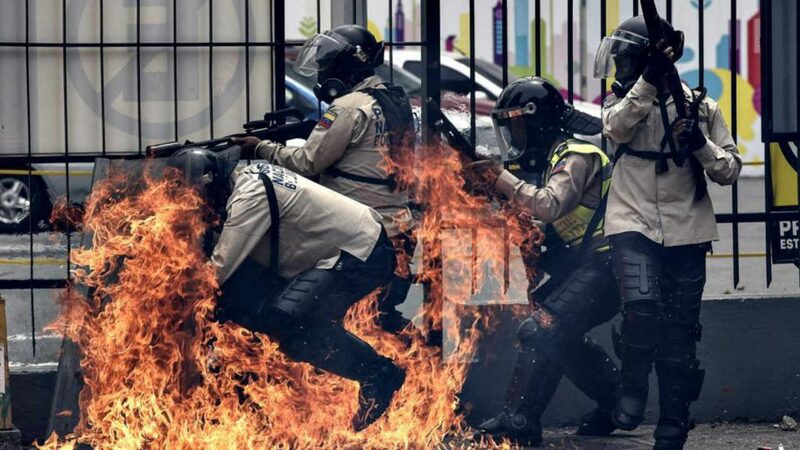 Venezuela is in a deep state of disarray, the crisis unfolding has set the country on a path of turmoil that it may never overcome; but to make matters worse – others, such as the USA and the UN want to intervene. One may recall the crisis in Ukraine or the crisis in Syria, or Libya, or Iraq, and so on, this is the result of international intervention. While the crisis in Venezuela is horrific and saddening, turning Venezuela into a political proxy war would make matters even worse. Geopolitically why would foreign countries want to intervene? By removing the narrative of humanitarian aid, a drastic economic motive comes about – oil. Venezuela holds the largest amount oil reserves in the world totaling 297 billion barrels (4.72×1010 m3) as of 1 January 2014; and control of their resources could prove to be a reason that outside countries want in. On a side note, while Venezuela is in a dire crisis, it is important to point out that the political landscape of Venezuela is dominated by the United Socialist Party, and stands to prove exactly what socialism brings about. This is why it is so important that America keeps its republic alive because if we fall into socialism – we too will end in a crisis just like Venezuela. In addition, the socialist mindset has been burrowed into thousands, millions across the United States and proves the point that when socialism enters – there is no more political diversity, there can be no differing thoughts, and everyone is at the beck and call of the state. France called for a regional and international mediation to be set up between the Venezuelan government and opposition groups to end the worsening violence in the oil producing nation. France has likened what the crisis could become to that of Syria and or South Sudan. “For France, alongside its European partners, the priority is the immediate end of violence through the support of a credible regional or international mediation that has the trust of both parties – government and opposition – to help restore dialogue and stability,” Foreign Ministry spokesman Romain Nadal told reporters in a daily briefing. After a closed-door session of the UN Security Council, US Ambassador Nikki Haley told reporters that the crisis in Venezuela is deepening. Intriguingly, the Venezuelan government has accused the US government of meddling in its internal affairs. Further sparking speculation that Venezuela could house yet another proxy war between the US and opponents. Such a crisis could also take place in America because our nation is two-steps from a civil war given the current amount of division within our own internal affairs. Furthermore, Donald Trump sparked a wildfire upon being selected, and it still has yet to be put out by the Deep State. Upon doing so, there is plenty of talk that said outcome could eventually lead to a civil crisis within the land of the free and the home of the brave. RTE. “France calls for international mediation for Venezuela.” RTE. . (2017): . .
Michelle Nichols . “United Nations Security Council turns eye to Venezuela crisis.” Reuters. . (2017): . .
Just something simple..Air drop food to them..They are desperate for food. Help them with the basics. They don’t hear you on an empty stomach.